Is this the ‘droid you’re looking for? 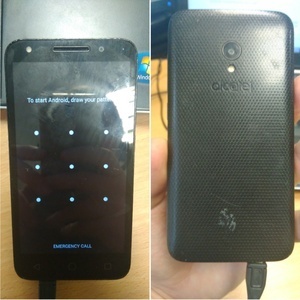 Alcatel U5 found on the [Dublin Bus] 14 bus this morning. It’s powered off so couldn’t take screen image and none comes up before the pattern lock. I’m in city centre or Beaumont if it’s yours. We Don’t Normally Do This – Christmas Puppy Edition Is This Yours? Missing Cats Do You Know Anthoney Hanrahan? Posted in Misc and tagged We Don't Normally Do This at 11:02 am on March 12, 2018 by Bodger. Would you not have given it to the driver, to put in the Lost Property? if you take out the SIM card from the phone you should be able to see which company the phones owner is with (Vodafone, Three etc). You can hand it into a store and they can determine who the owner is, from the number on the SIM card. Fair play on your efforts to get this back to the owner.